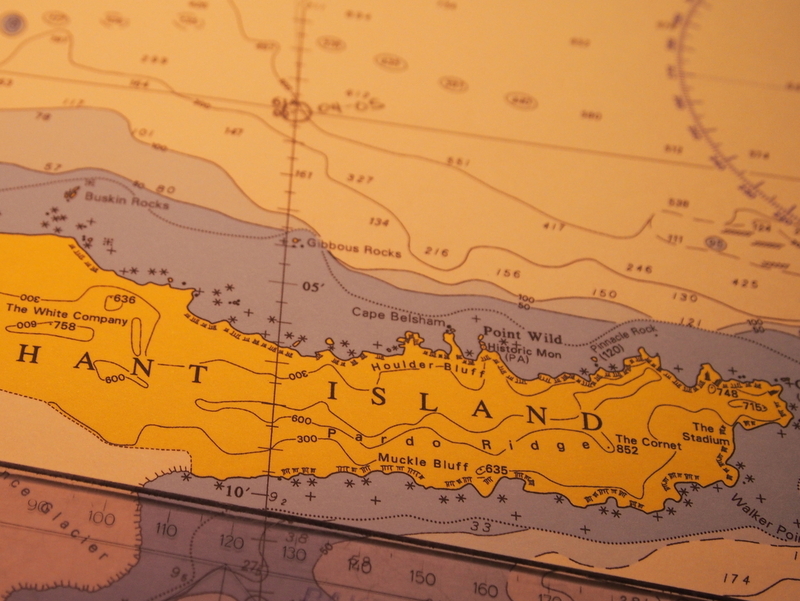 We’re stationed about five miles off of Elephant Island, somewhere to the south of us, lost in the fog. The island is lost in the fog, that is, we know with almost frightening accuracy where we are (60.9964 S 55.0307 W). It’s been one day short of a week since I’ve had sight of land, and I’m coming to appreciate a certain sense of disorientation that’s settling in from the absence. We moved around a bit when I was a kid, but never in my life have I spent much time out of sight of mountains. Wherever I found myself, I’ve always known I could skim the horizon and, catching sight of Long’s Peak, or Mt. Hamilton, or a jagged-tooth stretch of the Olympics, know pretty much where in the world I was, and which way I was facing. Without thinking, I must have internalized this into some sort of PPS (Pablo Positioning System) that was always running, even if only on local, transitory landmarks, because my first time in Minneapolis was a bit of a shock to the system. I remember stepping off the bus at the zoo, doing a few turns around to check in with my surroundings, and being struck with a dizziness that made me grab for the nearest lamppost. The word I coined for the sensation was “horizontigo”, the lateral equivalent vertigo’s which-way-is-up disorientation. I’ve become much more aware of my need for visual landmarks since. I notice myself stashing them away whenever I’m on the move – mental breadcrumbs that I pick up, rather than leave behind me in a trail. Without them I feel like I am walking with my eyes closed – we’ve all done that, right? When you find yourself on an empty sidewalk or deserted plaza and say “Alright – I’m going close my eyes and keep walking. Twenty steps – I can make it twenty steps.” And it’s a fun kind of giddy feeling, because you know there’s nothing to run into, and yet not being sure precisely where you are, not having visual proof, tickles at something in your brain. There’s a growing discomfort with each step and every passing second, like holding your breath too long, until you find yourself just taking a peek after ten. Just to be sure. Because ten is good enough, and you’ll try twenty next time. Really. And so here I am, ensconced in my ice tower perch, just taking a peek. Because I know there’s land out there, that hallowed island revered by Antarctic explorers, armchair or otherwise, evoking the names of Shackleton and Worsley, tracing the voyage of the James Caird on a map with their fingers. I know it’s there, five miles to the south of us. I just want to take a peek. 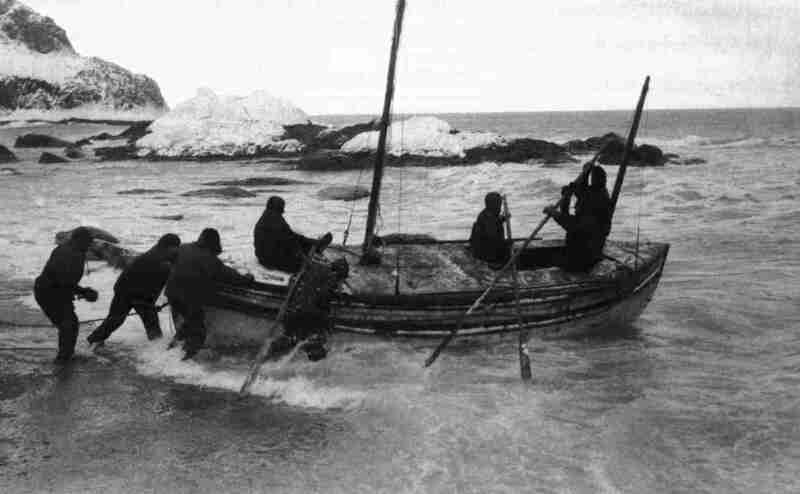 100 years ago, Shackleton, Worsley, Crean, Vincent and McNish set out from Elephant Island in the improvised lifeboat “James Caird” on what historians call one of the greatest ocean voyages ever.